The Willie Nelson biography is the story of one of country music's most enduring and internationally beloved stars. Nelson has a reputation for hard-living and a love for marijuana, a persona that has made him a pop culture icon. Although many music fans know his greatest hits, what many fans don't know is how long it took the music industry to embrace Nelson as a musician. Many fans also don't know how many of country's biggest 1960s hits were penned by Nelson. 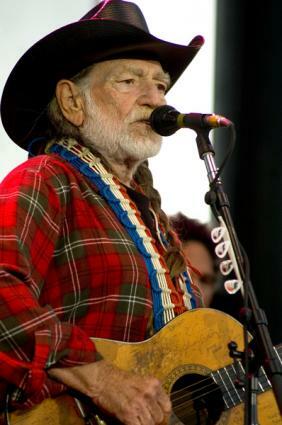 Willie Nelson was born Willie Hugh Nelson on April 30, 1933, in Abbott, Texas. What many take to be a nickname - Willie - is indeed his given name. Though Nelson was born to Myrle Marie and Ira Doyle Nelson, he was raised by his grandparents, William Alfred Nelson and Nancy Smothers. Nelson was interested in music from an early age, and when he was six, his grandparents gifted him with mail order music lessons and a guitar. He was a natural. He penned his first song at age seven, and by age nine, he was playing in a band. That band went under a few mutations and eventually became The Bohemian Fiddlers by the time Nelson was in high school. They often played at local events. During this time, Nelson also became a DJ for a few regional radio stations. After high school, Nelson opted for the Air Force. He was only on duty for nine months before he was discharged for a weak back. After the Air Force, he tried a year at Baylor University, where he studied agriculture, but eventually dropped out with the hopes of giving music a try. Nelson relocated to Vancouver, Washington in 1956, with designs on launching a music career. He DJed for a local radio station there, played on the local club circuit and sold a few songs to regional country favorites, but he failed to make much of an impact. After six years, he decided to pack his bags and head to the country music mecca of Nashville to try his luck there. By 1960, Nelson was beating the pavement in Nashville, trying to land a record deal. He couldn't get anyone interested in him as a musician - most labels were concerned that his voice wasn't strong enough - but he did garner attention as a songwriter. He signed a publishing deal with Pamper Music and went on to write some of country's biggest hits, including Night Life by Ray Price, Funny How Time Slips Away by Billy Walker and Crazy by Patsy Cline. Ray Price invited Nelson to join his band as a bass player, which drew him more attention as a musician, and eventually he inked a deal with Liberty Records. He had a few minor hits with that label, but nothing to really introduce him to a wide audience. Nelson, though wildly successful and profitable as a songwriter, struggled to establish himself as a musician all throughout the 1960s. Finally, in the early 70s, the tides changed, and Nelson found his audience. By the early 1970s, Nelson had given up on Nashville and returned to Texas, settling in Austin. He now had a deal with RCA Records, but had still failed to have any breakthrough success. At the time, Austin was undergoing a cultural rebirth and had become a top destination for "hippie" musicians. Nelson decided to throw traditional country music wisdom to the wind and try his own brand of country mixed with rock, jazz and even reggae influences in this new environment. It proved to be the right move. He was an overnight sensation on the local circuit. RCA was not thrilled with the new direction, but Atlantic Records picked him up and released Shotgun Willie, an album on which Nelson had a great deal of creative control. That album sparked the "outlaw country" sub-genre - country music that existed outside of the mainstream Nashville sounds. Outlaw country became the driving force of country music in the 1970s, and Nelson, along with Kris Kristofferson and Waylon Jennings, became the poster boys for the movement. Working together on various projects, these musicians managed to do what no country musician had done before - achieve platinum sales status. The rest of the 1970s and 80s were a time of great success for Nelson. His impact was felt on the country charts as well as the mainstream Billboard chart. In the 80s, he teamed forces with Kristofferson, Jennings and Johnny Cash to form The Highwaymen. Their album went platinum and remains on the greatest album of all times lists all over to this day. During this time, Nelson also appeared in several films and TV shows. In 1990, Nelson made headlines when the IRS seized nearly all of his assets to cover a $32 million back tax bill. It turned out that Nelson's accountants, Price Waterhouse, hadn't paid his taxes in years. Nelson sued his accountants (they settled out of court) and released an album called The IRS Tapes: Who'll Buy My Memories?, with the hopes of raising money to cover the fine. His friends also pitched in to buy back much of his seized property and returned it to Nelson. The debt was settled in full in 1993. Charity has always been an important part of Nelson's career. His Farm Aid concerts help US farmers make ends meet and he is also heavily involved in environmental causes and the legalization of marijuana. Stay up to the date on the ever-evolving Willie Nelson biography on his website.